​“Habit formation doesn’t just happen. Our brains aren’t wired to adopt a new habit that quickly. No matter how good and engaging the presentation is, habit formation takes time. It occurs when a new action, like the leadership skill of listening with intention and attention, is practiced over and over. ​To truly develop leaders, to give them the tools and skills they need to progress from individual contributors to powerful leaders, Levy proposes a 3-phase process that works. ​Workshops should deliver new skills, explain why they are valuable and how they can be applied to the workplace. But the majority of programs spend most of their time on this phase, even though it simply sets the stage for the more-important application phase. Levy suggests spending only 15% of any workshop on this knowledge-building phase. ​Leaders should begin applying new habits right away, both during training and in real-world application after the workshop session ends. Spending 80-90% of the time applying the new skill and reflecting on how it can be improved activates and strengthens the neural pathways. ​Homework assignments, where leaders apply their new skills outside the safety of the workshop setting, brings a new dimension to the learning. Real growth occurs when new skills are applied outside a comfort zone, in an unstructured setting. ​Debriefing after the application phase, or coaching to reflect on what worked and what could be improved, keeps leaders accountable for completing the homework assignments and helps them assess their performance for further improvement. In habit formation, the reflection process is still triggering the newly created neural pathway. This essential phase allows leaders to visualize or reflect on a single behavior hundreds of times, turning it from a skill into a habit. Habit adoption is a learning process, requiring time and commitment to be successful. 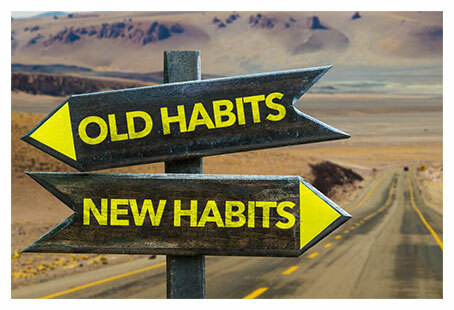 ​Habit change requires commitment from the organization. By practicing new skills and putting them into action, leaders can apply them to real-world situations, reflect on their success, and build new leadership habits faster than any other approach.